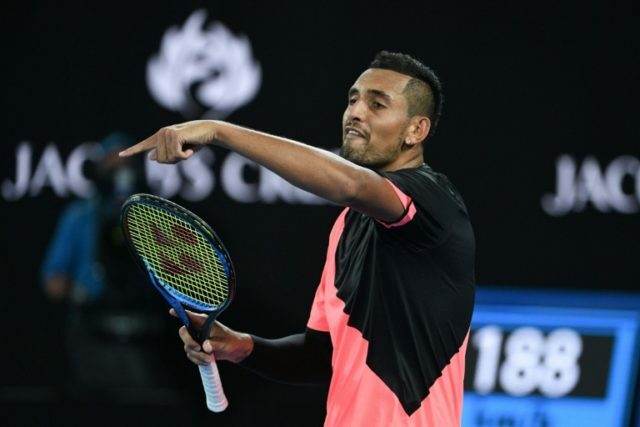 Melbourne (AFP) – Nick Kyrgios says he’s in a much better “head space” than this time last year when he was booed off court at the Australian Open, and looking forward to what comes next. Twelve months ago the combustible Australian was in a bad place after being jeered and accused of giving up as he crashed out in the second round in a stormy five-set defeat to Italian Andreas Seppi. Tennis great John McEnroe labelled him as “mentally (ranked) about 200 in the world” and said he was giving the sport a “black eye”. But a year on and Kyrgios seems to have turned a corner. He remains an exciting and unpredicable talent, but with a calmer persona. “I gave my best efforts this week,” he said after losing in four gripping sets to world number three Grigor Dimitrov in the fourth round at Melbourne Park late Sunday. “I came up short but I beat three quality opponents. I lost to one of the best players in the world but I went down swinging. “Obviously I feel a lot better this time around,” he added. “Last year I really didn’t know what I was going to do after the Australian Open. I feel like I have more of a vision and goal for this year. His run to a maiden ATP title on home soil at the Brisbane International and fighting performances without any tantrums at the Australian Open have won him new-found admiration in his homeland and from former greats. Kyrgios, still only 22, has credited the team structure of the Davis Cup, and the influence of captain Lleyton Hewitt, with helping him deal with some of his gremlins. “I just feel like I’m trying to get better,” he said. “You know, there was periods where I stepped on the court last year where I was just doing it for the sake of doing it. “In the off-season I didn’t really have a coach but I was working on two things that I thought I needed to work on — my volleys and transitioning, and my forehand return. In the past, Kyrgios has played on Hisense Arena at the Australian Open, but as his profile rises and demand to witness his exploits soars, he was this year elevated to the Rod Laver Arena centre court in prime-time. It was an experience he relished, with Rod Laver in the stands watching on Sunday and Hewitt and McEnroe in the commentary box. “I saw Rod there and Johnny Mac commentating in the box and we smiled a couple of times. It was obviously a massive experience.